While malware has been a thorn in the side of IT pros for years, some of the recent variants observed by the AlienVault Labs security research team, like Mirai, have turned our own Internet of Things (IoT) devices into weapons against us. Join us for a live demo to learn about the most common types of malware, and how you can detect infections quickly with AlienVault USM. Don has over 20 years of experience in product management and marketing, focused around the networking, security and semiconductors industries. His background includes roles with Ixia, Freescale and AMD, among other technology companies. 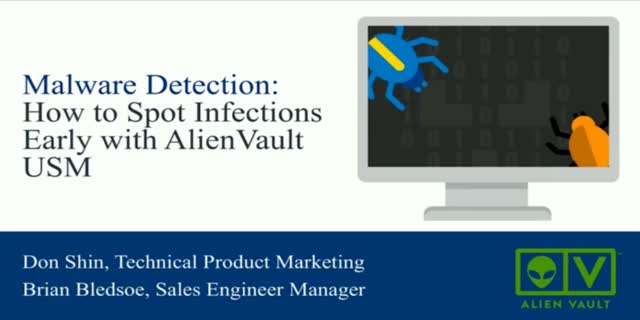 At AlienVault, Don enjoys developing technical resources to help customers understand how to best leverage the AlienVault platform to solve their security challenges. Brian Bledsoe is part of AlienVault's Sales Engineering group. Brian has worked in technology consulting and sales for the past 18 years. His diverse background in hardware and software sales and deployment enables him to help organizations of all sizes reach their technology goals.